Home / Energy & Sports drinks / Youngevity Y-DR8+™ Filters-4pk-BUY 5, GET 1 FREE! The Y-DR8+ bottle and filter is designed to help filter municipal tap water to improve its taste. * Make sure your water is always filtered. The Y-DR8+ Filter is designed to meet NSF 42 International standards for chlorine, taste and odor reduction. 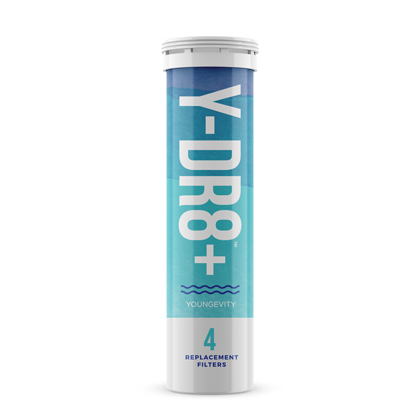 Youngevity Y-DR8+™ Filters-4pk-BUY 5, GET 1 FREE! Now you never need to run out of filters with this special Buy 5 get 1 free offer. The Y-DR8+ Filter is a proprietary, activated carbon cloth with great odor absorbing technology. -The filter is rated for two weeks or approximately 20 gallons. Usage is based on hydration with 3 Y-DR8+ bottles a day for 14 days. * – Improves taste of municipal drinking water by reducing chlorine – Providing better-tasting municipal drinking water while also reducing the following chemicals found in municipal water: Chlorine, herbicides and pesticides. – Remove filter to use bottle with Youngevity powder products The Filter provides portable point of use filtration, so keeping the Y-DR8 bottle System with you at all times will gives you access to inexpensive, great tasting, filtered municipal water wherever you go. Keep additional bottles at work and in your car so that you will always have access to great tasting, filtered municipal water. There is no need to waste money on bottled water again! Water quality and bad tasting chemicals like chlorine vary greatly throughout the U.S. Many U.S cities have water contaminants and chemicals like chlorine above the national health standard. Stock up on 24 additional filters for you and your family for great tasting municipal water. Filter is designed to meet NSF 42 International standards for chlorine, taste and odor reduction. Filter has been tested per EPA drinking water quality standards. Filter designed for municipal tap water only. Substances reduced may not be in all users’ water. Expended Filters are recyclable, the filter can be recycled through most local community recycling programs, further reducing any carbon footprint.